Saundersfoot railway station serves the seaside village of Saundersfoot, Pembrokeshire, Wales. It is managed by Arriva Trains Wales. It is usually a request stop apart from the limited stop First Great Western Pembroke Dock services which make a scheduled stop here. The station is a mile from the village centre down a country lane 'B road' with no designated footpath. It is recommended that you book a taxi from the station if you arrive with luggage. The station is within the Pembrokeshire Coast National Park and about a mile from the coastal path which can be picked up about a mile down the lane at St Issell's church. Here's the our members favorite photos of "Railway Stations near Amroth". 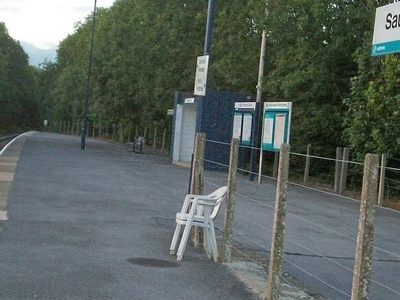 Upload your photo of Saundersfoot Railway Station!